With the ongoing trend of presidents and senior-level administrators retiring from jobs in higher education, the need for smart and careful recruitment of new academic leaders is now greater than ever. To find and recruit excellent executive talent online, institutions throughout academia trust PresidentJobs.com. Recognized in higher education as an essential online platform for recruiting academic leaders, PresidentJobs.com is the place to advertise senior-level positions including president, vice-president, provost, and chancellor. This year, more than 1,000 colleges and universities, executive search firms, and ad agencies have posted executive positions on PresidentJobs.com. Institutions advertising with us ranged from small rural community colleges to large state universities and Ivy League institutions. Our website is a popular choice among executive search firms when they are deciding where to advertise their clients' jobs. PresidentJobs.com works with dozens of leading executive search firms in academia. To view the full list of executive firms and consultants we work with, please click here. Similarly, we work with large and small advertising agencies that serve higher education. Agencies select PresidentJobs.com when their clients have important executive jobs to fill. To view the list of advertising agencies we with work, please click here. PresidentJobs.com makes advertising executive-level jobs easier and more affordable. We help institutions recruit with speed and precision, because we only showcase senior-level, executive jobs. With us, recruiters can rest assured that they will reach the right audience of academic leaders and executives each time they post a listing on our site. Superb customer service is the cornerstone of how we do business at PresidentJobs.com. When you advertise with us, our friendly and responsive team of advertising experts will be here to guide and help you during every step of the process. 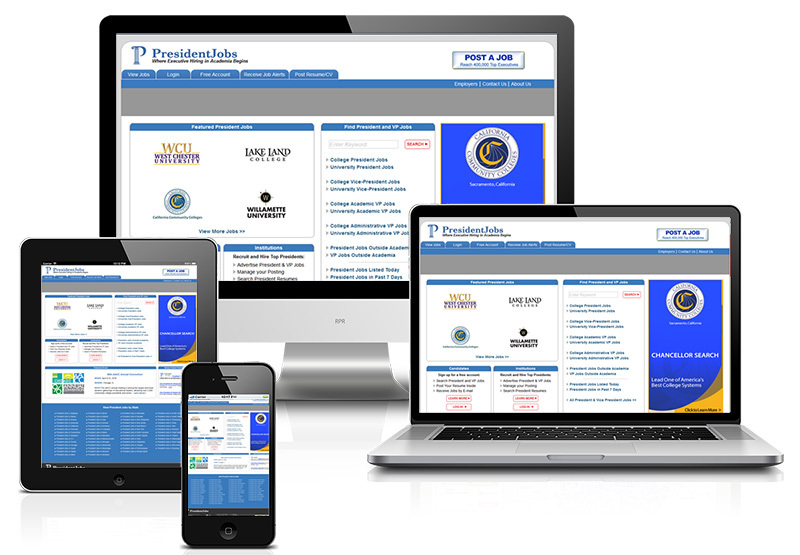 PresidentJobs.com is visited by thousands of the dynamic and seasoned executives that institutions want to hire most. Many of these administrators are already working in various college and university positions. They visit PresidentJobs.com daily seeking new opportunities that will enhance their careers and give them greater opportunities to lead and serve. Executives in all 50 states have created PresidentJobs.com accounts. Many of these talented leaders have signed up to receive our daily Job Alert emails so they can quickly learn when new jobs are posted on our site. When your job is listed on PresidentJobs.com it will likely be sent via email to thousands of executives who receive our job alerts each day. To place a job listing with us today, please click here. To learn about display banner ads, please click here. With more than two decades of experience in higher education and recruitment advertising, we understand that good results and ROI are extremely important in high-level executive searches. Therefore, we gladly provide institutions with around-the-clock access to tracking statistics to see how many job seekers are view and clicking on their jobs. We are proud of the results we deliver. As a courtesy, every week we email job tracking stats to institutions. If you'd like to speak with one of our recruitment advertising experts before posting your job listing, feel free to contact us anytime at 404-915-7300. We will be glad to answer questions and provide you with a free consultation and recommendations that will help you find the best recruitment solution for your institution.